Just weeks after the ESA made the first-ever landing on a comet, another groundbreaking proposal to tackle an unexplored frontier has surfaced--but this time, in the deep sea. After two years of design development, Tokyo-based Shimizu Corporation just unveiled blueprints for the world's first underwater city that, by the construction company's estimates, could be completed in just a few decades at a cost of $26 billion. Dubbed the "Ocean Spiral," the sustainably powered, Atlantis-like metropolis is the latest futuristic scheme proposed by Shimizu. 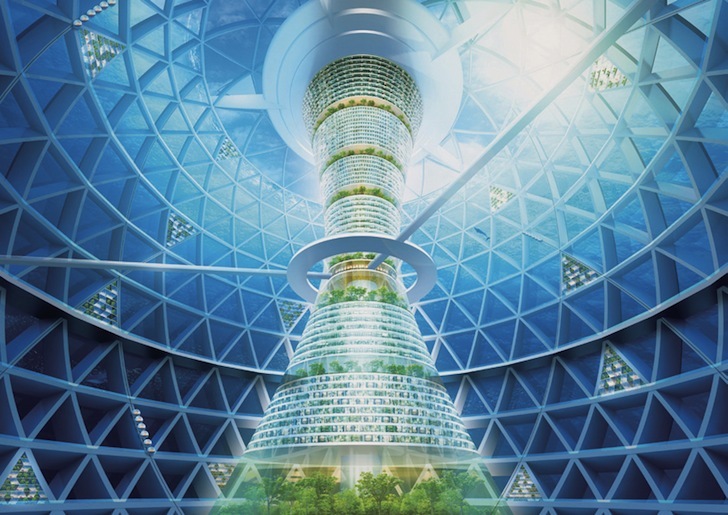 Shimizu Corp.’s vision of the modern-day Atlantis is divided into three parts, with the underwater city contained in a 1,600-feet-wide sphere that could house up to 5,000 residents and comprise mixed-use developments where people can live, work, and play. The spherical city floats at the surface of the sea, but can descend down a 9-mile-long spiral pathway into the deeper depths during times of bad weather. The spiral pathway is connected to a research facility, which would excavate the seabed for precious metals and create energy for the city above using temperature differences in ocean water. “This is just a blueprint by our company, but we are aiming to develop the technology that would enable us to build an underwater living space,” Shimizu spokesman Masataka Noguchi told the Wall Street Journal. Desalinated water would be created using hydraulic pressure and fish farms would be built around the structure. The proposal also mentions harnessing the power of microorganisms to convert carbon dioxide to methane energy. Although seemingly farfetched, Shimizu’s proposal underscores fears of sea level rise and loss of habitable environments. The design was realized with help from University of Tokyo researchers, the Japan Agency for Marine-Earth Science and Technology and the government’s Fisheries Research Agency. The Shimizu construction company estimates that the technology to implement the “Ocean Spiral” could be in place by 2030. Desalinated water would be created using hydraulic pressure and fish farms would be built around the structure. 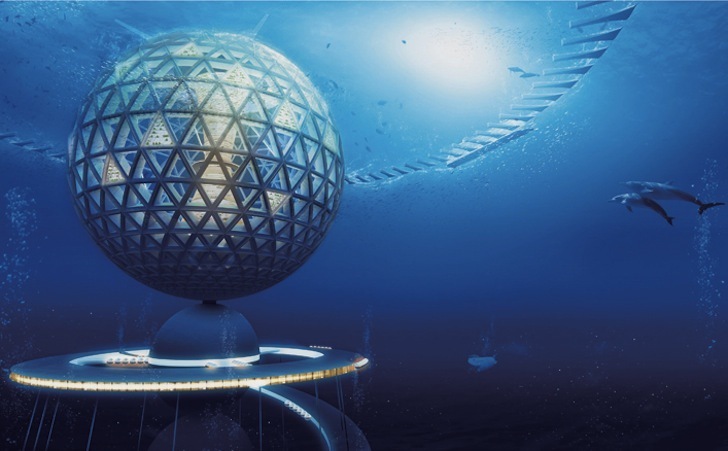 the underwater city contained in a 1,600-feet-wide sphere that could house up to 5,000 residents and comprise mixed-use developments where people can live, work, and play. The spherical city floats at the surface of the sea, but can descend down a 9-mile-long spiral pathway into the deeper depths during times of bad weather. The spiral pathway is connected to a research facility, which would excavate the seabed for precious metals and create energy for the city above using temperature differences in ocean water. The proposal also mentions harnessing the power of microorganisms to convert carbon dioxide to methane energy. The Shimizu construction company estimates that the technology to implement the "Ocean Spiral" could be in place by 2030. Section view of the Ocean Spiral.